Part of the fun of CES is getting to use some of the newest technology. There isn’t as much pure photo tech there as in previous years (although I did get to use a new Nikon D5 and a new Nikon D500, and wrote up my experiences). However, there were plenty of interesting photo-friendly drones. One that I’ve been tracking since last CES is the HEXO+. 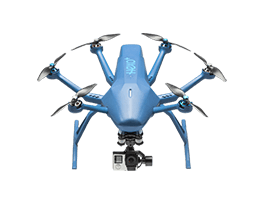 It is designed to follow athletes or other action activities, including performing a series of pre-configured camera actions (like pan, zoom, 360) en route. I wrote up my experiences with the now shipping drone, and a glimpse into its future.